I have a number of examples of exporting to Excel from MS Project (exporting task hierarchy and exporting monte carlo simulation data) but many people want to do just the opposite. They want to open a Project file from Excel. So here is a short example which shows opening the Project application from excel, creating a new file and adding a task. 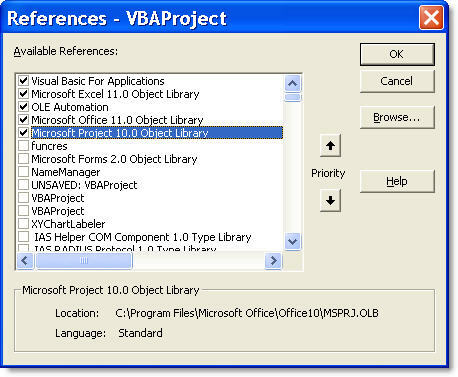 The first thing that you need to do is to set a reference to the Microsoft Project Object Library. To do this go to 'the "Tools Menu" in the Visual Basic Editor (hit ALT+F11 to get there from Excel). This should bring up a dialog box showing all of the available libraries. You will probably have to scroll down a bit to find the project library. Here you can see that I'm using Project 2002 as it is version 10. 'a warning and then quits. Users without Project installed will see this message. MsgBox "Project is not installed"
'we set the title property (you can do whatever you want here. newProj.Title = "My New Project"
Obviously you will want to do more where this leaves off, but it should be enough to get you started with using Project from Excel. Project2Excel is an reporting and integration tool for Microsoft Project and Microsoft Excel. User defined templates provide users the ability to import/export data to/from Excel while retaining the hierarchical structure contained within Microsoft Project. This product provides an extended Excel formula language to support calculations based on the hierarchical structure of the project plan. 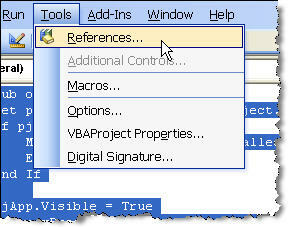 VBA Source Code is included. The previous article is Microsoft Project Tip - Formulas and the IIF statement. The next article is Formatting Task Links in MS Project.